We all depend on the earth's ecosystems. They provide vital services such as water, clean air, food and shelter. Stable, robust ecosystems also help people to mitigate the impacts of natural disasters, and to adapt to the changes in our atmosphere brought on by climate change. People are placing an increasing demand on earth's ecosystems as our numbers increase and we reach unprecedented levels of development at a global scale. When the tipping point is reached, people will no longer be able to depend on the support of these systems and disaster will loom. Working on the philosophical understanding that human well-being is dependent on environmental health, Wildlands has adopted a CEBA (Community Ecosystems Based Adaptation) model as philosophical construct and organising principle for where we work and what we do. CEBA moves beyond the more traditional concept of Ecosystem Based Adaptation (EBA), mainstreaming it into the green economy as an adaptation tool that promotes social inclusiveness and sustainable development. CEBA highlights the interconnectivity between local communities and their supporting ecosystems. Project Rhino Tracker - by fitting the latest tracking technologies to Rhino in protected areas, we allow for a more efficient use of field rangers, as we have a better knowledge regarding the Rhinos movements and behaviors, and can deploy field rangers at strategic locations to counter any vulnerable situations. This includes the use of satellite transmitters and UHF data-loggers, which provide the most real-time information on the Rhino that is available to date. 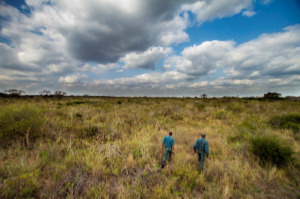 Project Rhino Aerial Support - there is little doubt that the positioning of additional aircraft and helicopters across northern KZN will have a significant impact on reducing rhino poaching, especially in the private and communal areas that do not enjoy the same level of paramilitary support that Ezemvelo KZN Wildlife's conservation areas do. Wildlands aims to raise the funds required to support and maintain the aircraft in order to allow it to fly a minimum of 40 hours per month, covering the key properties where rhino populations occur. Project Rhino Investigations & Prosecutions - One of the key gaps identified in addressing the rhino poaching crisis is in providing a professional and well-coordinated prosecution of key individuals or syndicates known to be involved in poaching around rhino reserves. Wildlands aims to support a team of investigators and attorneys to prosecute known individuals in KwaZulu-Natal, with the aim of setting a precedent for other poachers, who will then know that the conservation sector is serious about taking these culprits to task.